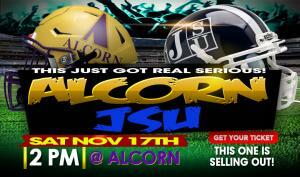 Tickets for Alcorn vs Jackson State in Lorman from Impact Tickets, LLC. THIS JUST GOT REAL SERIOUS! It's not just the matchup of the year! It's the matchup that will determine where the SWAC Championship will be held. If Alcorn wins, the Braves will host the SWAC Championship! So, this is the biggest game in black college football in Mississippi. This rivalry will be a heated one. Get there early because the lines will be long and there will be plenty of tailgating. ASU vs JSU, it doesn't get any better than this. THIS WILL BE A SELLOUT!!! TICKETS ARE GOING FAST! GET YOUR TICKETS NOW! SECURE YOUR TICKET. TICKETS CAN ONLY BE SCANNED ONCE!